I've been stalking Marshall's these last few weeks in search of my conditioner! 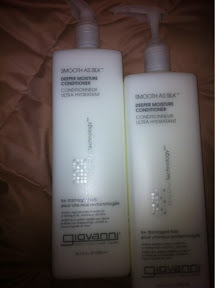 As you all know the Giovanni Smooth as Silk is my new staple deep conditioner. Marshall's has been out of it these last few weeks and I was about to buckle down and order the salon size online. I no longer buy regular size bottles of conditioner...Marshall's has spoiled me with their salon sizes for half the price. So needless to say when I saw these bad boys on the shelf I scooped them up with the quickness! And I will continue to do so whenever it's in stock lol yes...it's THAT serious. I just recently started using the smooth as silk conditioner... completely IN LOVE!!! I must try it! I got this new hair conditioner from Target for curly hair and so far so good but I definitely need to check that out. I don't blame you. It's a good deal! I just started using the tea tree shampoo and I love it! I'm going to try other products soon!